Some of you may have seen our Webinar on using Kaseya K2 to audit your machines, to verify the versions of 3rd party software. In short, you run the script(s) on the machines you are auditing, and the script writes a series of tags to the Procedure Log, and we use those tags to generate a report. Normally you would use a View to help segment a part of your installed agent base, and focus attention on just those results, however there is no way to create a View based on the results of a Procedure log, but there is a way to generate a view based on having run a script. This is a great way to create a list of machines that need some type of follow up later. 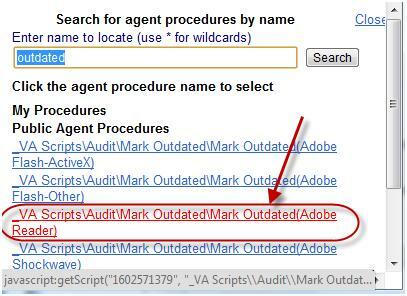 We demonstrate this using an Audit script, but you can do this with any script. We created a “dummy” script for each audit we wanted to track. All this script does is write an entry in the script log. Create a View to show the machines that have run the “dummy” script. Do this by setting View to <No View>, then clicking Edit. “Save As” to create a new view, give it a name, and save. Change the “executed in the last ‘x’ days” (#5) to the period of time that is appropriate. This will depend on when you ran the Audit script. Change this as needed. You are done! The next step is to run your audit script on the desired machines. Wait for them all to finish, and then use your new View to identify all the systems that have out-of-date software. You can then use this View and run the correct installation/update Procedure on only those systems that need it.